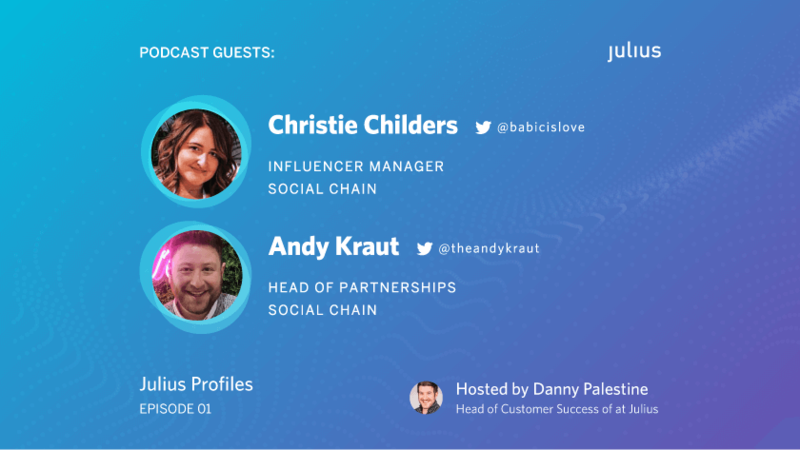 In the first episode of the Julius Profiles podcast, the wonderful Christie Childers and Andy Kraut from Social Chain do a deep dive with Danny on personalization and the huge role it plays in managing relationships between clients, influencers, and consumers. We all agree that in a world of data and business, the job of relationship and partnership managers is primarily to put people first. Christie and Andy discuss how influencer marketers can keep it real online and off, and how these strategies can be adjusted depending on the person and their role. Our guests share golden insights about how to build long-term, mutually beneficial relationships. Christie and Andy do a great job of unpacking their experiences and expertise surrounding influencer and client relationships, covering many of the angles that should be considered in this business. Be sure to join us for this great discussion! Social Chain USA’s Influencer Relationship Manager, Christie Childers (@babicislove), and Head of Partnerships, Andy Kraut (@theandykraut), use their all-star relationship-building capabilities to create dynamic, successful brand awareness and sales campaigns with global brands such as Brita, GoGo squeeZ, Orbitz, Pretty Little Thing, and Primark. They lead their teams to tailor social-first strategies to not only meet but also exceed client objectives while working cross-functionally within their organization to analyze and create influencer-driven concepts from ideation through project execution. They both agree now more than ever, in an industry that is becoming saturated quickly, fostering authentic relationships with your creative partners, talent agents, and brand teams is essential in executing custom campaigns for clients that will resonate with relevant audiences.